A "lost" photo - would we like to scan it? Yes we would! Before the bypass (Kingsway) was built to the north of Hadleigh High Street in 1924 there was a notorious accident ‘black spot’ at the junction of London Road with Rectory Road: it was the scene of many a crash – even before cars were invented. It was almost as if the London Road was surprised at the sudden appearance of the ancient church, and did a smart dog’s leg to the south to avoid it! Alas, many horse-driven vehicles were, it seems, equally surprised! 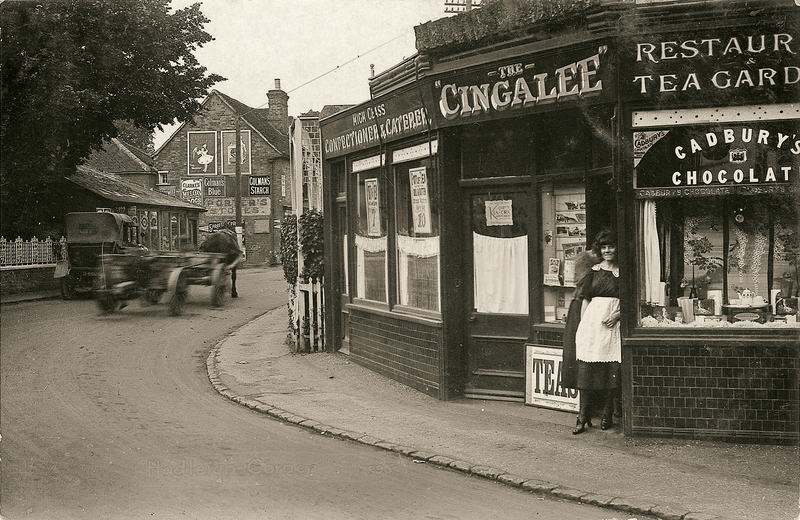 It was known as Hadleigh Corner. There was a motley row of shops around this bend, to a great extend obscuring the view of the Church from Castle Lane, as a perusal of Robert Nichols’ wonderful Hadleigh Postcard Memories would confirm. Some time before 1911, the Cingalee Restaurant and Tea Gardens set up here, (alongside Martin the Tailor and Perkins the Confectioner) to service the passing trade at this busy junction. Touring cyclists, it seems, were particularly welcomed in the early days and, in latter years, crews from the omnibuses and their passengers. 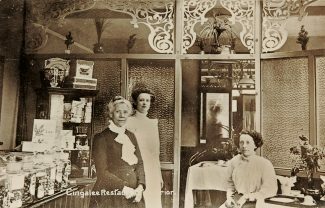 It appears it was a successful enterprise for, eventually, it occupied all these shops and dominated the corner for several years (at least until 1923). 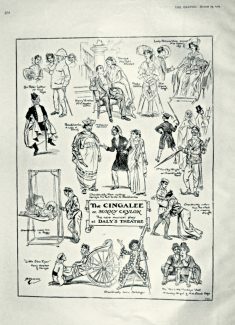 But why the strange name, ‘Cingalee’? The Cingalese are a race of people from Ceylon (now Sri Lanka). 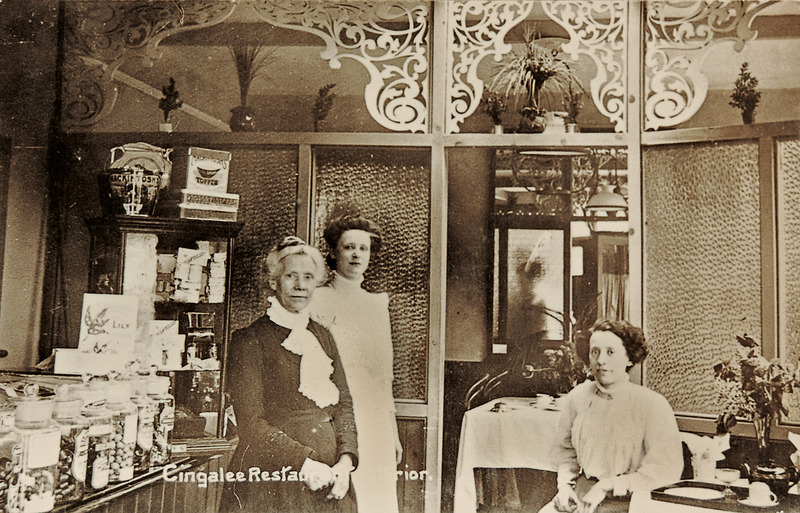 Ceylon had become, since the 1880s, the principal source of our tea. 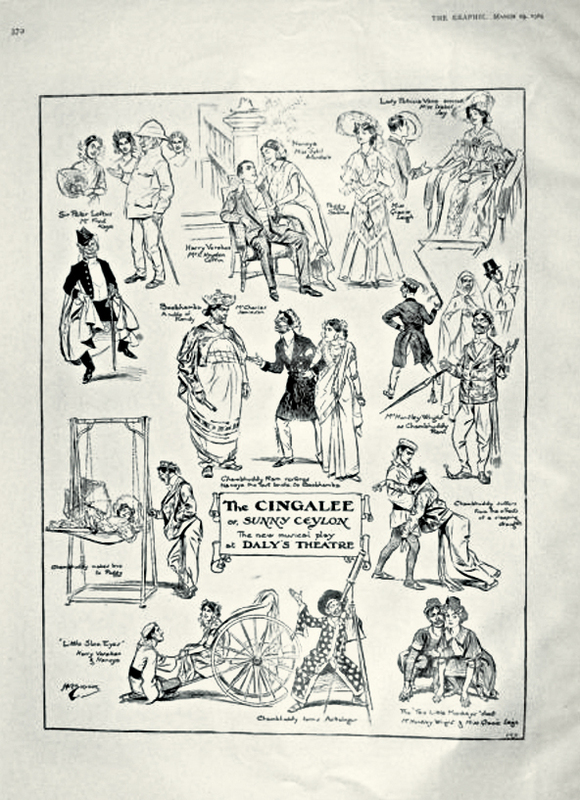 In 1904 a successful two act musical play by James Tanner called The Cingalee, or Sunny Ceylon was staged at Daly’s Theatre (Cranbourn Street, just off Leicester Square). The Music was by Lionel Monkton and Paul Rubens and the lyrics by Adrian Ross and Percy Greenbank. 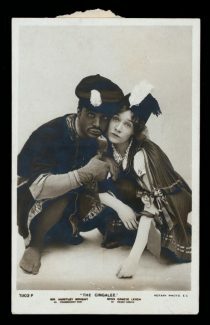 Monkton was an especially important figure in the history of musical theatre and the show ran for just over a year in the West End (considered a good run in those days) but proved considerably less successful on Broadway. The story is set in a colonial tea plantation and thus satisfied the penchant for exotic foreign settings which had been fuelled by Gilbert & Sullivan’s Mikado and, like the Savoy Operas, comprised the usual quota of frivolous nonsense, farcical mix-up, comedy and romance. One of the most popular songs in the score is called simply ‘Tea, tea, tea’. 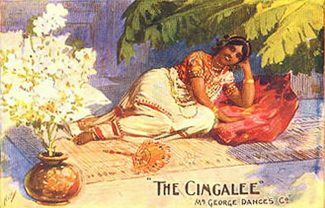 Monckton’s catchy sextet, ‘The Island of Gay Ceylon’ and ‘Pearl of Sweet Ceylon’ and Ruben’s ‘White and Brown Girl’, ‘Sloe Eyes’, ‘Monkeys’ and ‘You and I’ are other highlights of the musical score. The condescending racial overtone of The Cingalee’s libretto, however, would be unacceptable today, and so The Cingalee is unlikely to ever be revived and there is no recording available of the whole show. It was last staged, so far as I can tell in 1944 (as an amateur production, in Nottingham). 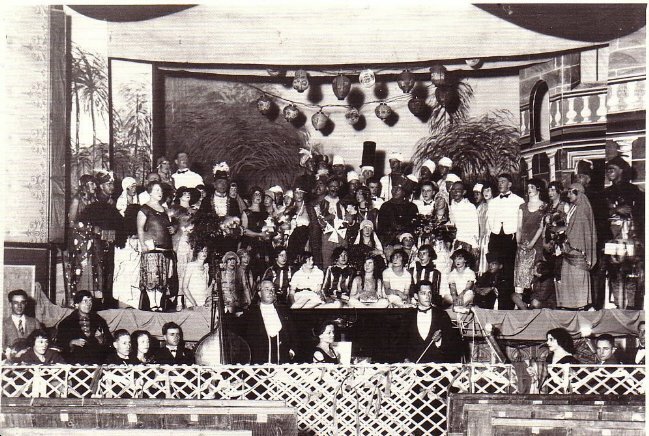 It is hugely intriguing that Southend Operatic and Dramatic Society (SODS) were the first amateur group to ever perform it, in 1912. Was there some connection here with our Hadleigh entrepreneurs? Harry Vereker, the owner of a Sinhalese tea-plantation, wishes to wed Nanoya, one of his workers. She, however, cannot follow her inclinations having been married at four years old to the potentate of Boobhamba. To avoid this marriage she has fled, disguised, from her position as the owner of the very plantation on which she now works, and Harry has been conned into ‘buying’ it by a rascally lawyer, Chambuddy Ram. But the High Commissioner orders that Nanoya must be found and Ram is accused of hiding her. He is also accused of the theft of a famous black pearl and ordered to produce both at once. The pearl turns up with one Peggy Sabine, engaged as governess for Harry’s wife-to-be. Peggy has won it in a gambling game in London. Ram sets out to get hold of both Peggy and the jewel, not to mention Nanoya. Things are made easy for him when Harry buys the pearl as a gift for Nanoya and Ram easily delivers both parts of his commission up to the judiciary. In the second act Nanoya is freed from the unhappy early marriage by the combined efforts of everybody. Boombhamba has a harem in which every wife wears a different colour as an aid to identification. Since there is only one colour missing from his rainbow he can have only one wife more. At the crucial moment he spots one he prefers to Nanoya, who is sent packing back to her Harry’s arms. 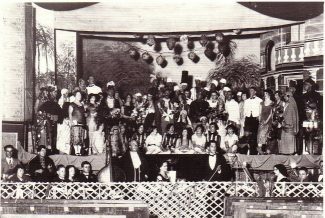 Copied from the programme of the Glen Innes Musical Society production of The Cingalee, NSW May 25th-29th 1926. To make Tea all the day long. And take out tea very strong! To chat while tea’s being made. That’s out tune, cup and spoon. Verse two gets every so slightly riské, in an Edwardian sort of way (see the music score appended below). If i remember rightly that shop on the corner was still there up until the early 1960s, although not a restaurant by then.